As Mother’s Day is fast approaching in the States, if you are in Second Life, you might be asking if or how you can become a mother in Second Life. There are various ways to become a mother, you can give “birth” or even “adopt” prim based children or kid avatars. I decided to get together a group of moms in Second Life, in order to find out what exactly is the process of becoming a mum (mom if you are on the other side of the pond) in Second Life. I later would dub this group the “mummy panel”. Selecting a baby was the first thing everyone suggested on the mummy panel. As one of the mum’s put it, everything is based around the type of baby you have, from accessories, to the clothing you would later purchase for the baby. Everyone at this panel had a Zooby baby. Zooby babies are one of, if not the most popular baby in Second Life. I teleported over to Zoobyville to check out the Zoobies. It was quick to see why Zooby babies were very popular. The current generation of Zooby babies comes complete with different poses, starter clothing, sounds, and you can even add a friend or a parent to the baby. Zooby babies also come with an accessory option, so you can add a diaper, blanket, pacifier, and hat to the baby. The newest feature is stages, which is somewhat like a mini game with the Zooby. Stages are when the baby grows and is able to do things comparable to a real life baby. Some stages include being able to cry, kick a ball, walk, and play with various toys. At Zoobyville, you can also purchase various furniture, strollers, and clothing for your baby. You can also purchase different types of hair and network with other Zooby owners. Zooby babies come in many nationalities and ethnicity I even saw a vampire Zooby baby! After you have chosen your baby, it is time to adapt your avatar to the change of being pregnant. If you decide to become “pregnant” in Second Life, there are a variety of ways to do it. The assembled mummy panel recommended purchasing a pregnancy hud. 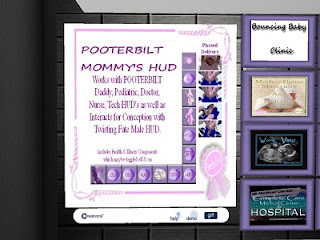 The recommended pregnancy hud was the Pooterbilt mommy hud, which also has a daddy hud you can purchase separately. I went to check out the Pooterbilt headquarters and noticed a variety of huds and pregnancy devices, including medical huds for the Dr, nurse, and medical techs, as well as conception huds. The mommy hud had a phased delivery option and included a variety of health and illness components that a mommy could “experience” in Second Life. Of course you may want to alter your shape to include a tummy on your avatar or you may simply wish to keep your avatar the way it is. You can either change your shape manually or do a search on marketplace for pregnancy shape. Many options will become available. The mummy panel recommended changing your shape yourself; to save a few lindens but one did mention that she had purchased a pregnancy shape on the marketplace, to add to that realism feel. Once you have your pregnancy hud, you are ready to select a pregnancy clinic. You do not have to have a pregnancy clinic, as you can simply “deliver” your baby yourself, but if you want a complete realism birthing to mommy experience, then a maternity clinic adds to the entire process. 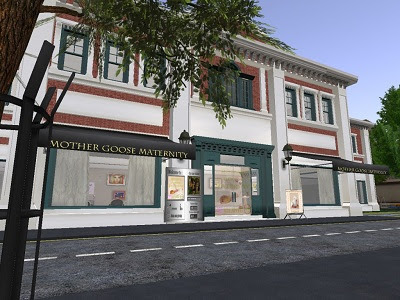 There are many maternity clinics in Second Life, but I went with the opinion of my mummy panel, after all they are the experts! The chosen clinic was the Mother Goose Clinic. This clinic has been around in Second Life for a few years and offered a variety of packages. You can choose to give birth in a regular bed, in water, or in the nature. The clinic also offered home bed and water packages. The packages went further and offered a variety of things such as Lamaze and yoga classes, a birth certificate, and a complete labor and delivery option. Other options included pre and post natal visits, and ultra sound photos. I noticed that the clinic also sold the Pooterbilt huds and other various birthing, pregnancy, and first time mom accessories. 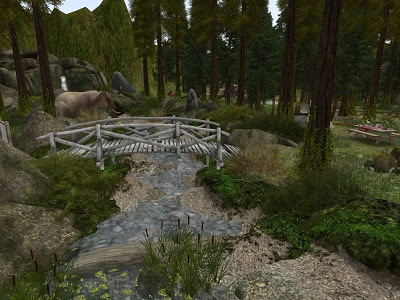 With the mentioned items you should be well on to motherhood in Second Life. Of course after you give “birth” you may wish to plan family outings. A great place to go is the Kids Reserve Family park, which is a kids and family friend location in Second Life. The sim is rated pg/G and sim owner Daviano Constantine or Davy for short, offers storytelling, dances, and has 7Seas family events every day at 810 am slt. The sim also had campgrounds and plenty of places for families to walk around and enjoy the woodsy and outdoor surroundings. Of course as your baby grows you may opt to send him or her to preschool or school. There are many options available and just a search away in Second Life.